So your rose bush is blooming magnificently. Bright, big flowers… glossy green leaves… gosh, it's doing so well it's actually blooming in two colors this year! If so, you don't have one rose flowering in two colors: you have two roses. 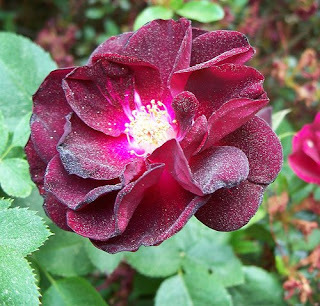 See, most roses sold and planted in California are hybrids — genetic crosses between two different varieties. Not at all Frankenflowers, they're bred this way to give us distinct joy: brighter flowers, glossier leaves, repeat flowering, greater resistance to disease. You can't have it all, though, and what makes them beautiful upstairs makes them weak downstairs. Enter that miracle of modern ancient technology, grafting. By splicing that gorgeous body onto robust roots that can handle frost, rot, nematodes, fungus, drought, etc., humans figured out that we can have it all. The only problem, and it's really just a minor one, is that those roots are — by definition — more robust than the body. And just like the body, their prime directive is to grow. Which means you get robust growth… just from the rootstock, not the body. So those smaller, maroon flowers are "suckers" growing from the rootstock, most likely a variety named "Dr. Huey" (named after a prominent early-1900s rosarian) that is used for almost all California-grown hybrid tea roses because it can handle poor soils, shade, cold, and disease (although it has shown some susceptibility to nematodes in Florida). Unfortunately, although "Dr. Huey" is beautiful in its own right, if left unchecked its vigor will sap the plant's energy from the more desirable body, the one you presumably bought the plant for in the first place. To prevent this fate, prune the suckers back as close to the primary cane as possible. This directs all that vigor back into the body of the bush… so it can bloom magnificently after all. :) I have two of these right now. And, though it looks cool, I will take your advice and prune 'em back. Jenna, do you know what varieties your two roses are "supposed" to be? Depending on their vigor, you might be able to let them coexist with the rootstock... IF you're vigilant about not letting the rootstock take over.